Theophilus, which is Greek for "Friend of God," is not a common name today, although it was one of Mozart's baptismal names. Theophilus Cibber was a Shakespearian actor of the eighteenth century until he drowned off the Scottish coast. Theophilus Van Kannel of Philadelphia invented and patented the revolving door in 1888. Theophilus Connor was the segregationist Commissioner of Public Safety in Alabama who preferred to be called "Bull" Connor, and there is a "Hip-Hop" singer from Brooklyn named Theophilus London. The eponymous character in Thornton Wilder's novel Theophilus North may have been based in part on the author himself. Farther back, there were: a Benedictine monk named Theophilus who wrote volumes on metallurgy and painting in the eleventh century; an iconoclastic Byzantine emperor in the eighth century; and a fourth-century Patriarch of Alexandria, Egypt. Lastly, a lunar impact crater on our moon is named Theophilus. 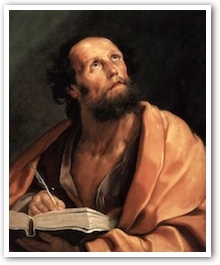 What matters is that Saint Luke addressed his version of the Gospel and his Acts of the Apostles to Theophilus. Who was he? If he was the Sadducean high priest Theophilus ben Ananus, brother-in-law of the high priest Caiaphas, co-conspirator in the Crucifixion, this would explain some of Luke's emphases on the temple rites and his emphasis on bodily resurrection, which the Sadducees denied. Theophilus — "Most Excellent" as St. Paul uses it — was a form of address to Roman officials: St. Paul addresses Festus that way, as does a certain Tertullus speaking to Felix (Acts 26:25; 24:2). This "Most Excellent" Friend of God could have been Titus Flavius Sabinus II, an older brother of the future Emperor Vespasian and a relative of Pomponia Graecina, wife of the general, Aulus Plautius, conqueror of Britain and its first governor. She evidently converted to Christianity and used her political connections to assist Paul in prison when Luke was with him. Or, Luke may have just been using Theophilus to stand for anyone who wants "an orderly account" from this man who had "followed all things closely for some time past" (Luke 1:3). This meticulous history makes clear that these events happened, woven in and out of the daily drama of existence and changing the world. Luke had the singular advantage of having the Mother of God as his most important research assistant, along with Peter who was one with Luke in sticking to the facts. "For we did not follow cleverly devised myths when we made known to you the power and coming of our Lord Jesus Christ, but we were eyewitnesses of His majesty" (2 Peter 1:16). I write this as I drink tea from a mug inscribed with Blessed John Henry Newman's words from his Development of Christian Doctrine: "To be deep in history is to cease to be a Protestant." That applies to everyone who wants to be shown the true sources and progress of the Church. Whoever Theophilus is, or in whatever generation he lives, Luke uses history to show him the Lord of History. Father George William Rutler. "Theophilus." From the Pastor (February 3, 2013).